This is the fourth in a series about nine clients and friends who successfully transitioned or transformed their careers after age 50. This month I will describe how a former client downshifted two levels in her early 50s. 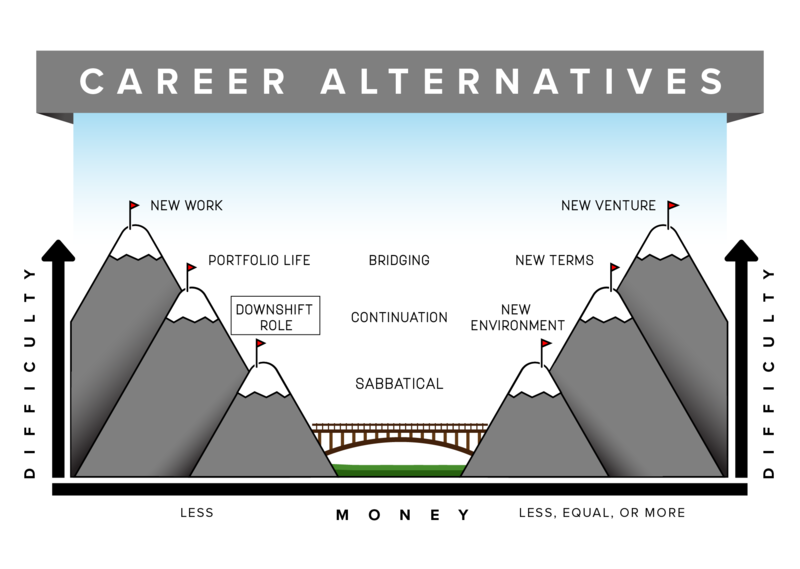 The graphic above illustrates the degree of difficulty and the economic considerations for a downshift role option. 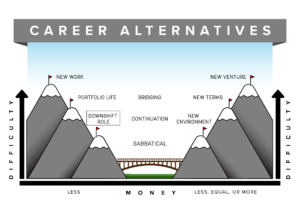 This career alternative involves moving from your most recent role to a lower level of responsibility and/or lower title. It was a Wednesday afternoon a few years back when I got the call. My client sounded anxious and deflated. The hiring manager had just informed her that while she might be a great candidate for the job, there was serious concern that she was overqualified. They would get back to her Friday after considering her candidacy a few more days. Her job campaign had gone on for several months, and she was more than ready to get back to work. Here were my questions to her that afternoon. Was this a good job? The job was at a lower level than her previous position, and there is always a question of how challenging and engaging a job will be if it is one or two levels below the last one. Would she be frustrated or leave if not sufficiently challenged? Would she be more qualified than her boss and become a possible threat or annoyance? Would she be excited about going to this work each day, especially after the initial enthusiasm wore off? Would her skills and knowledge fit the new role? When I asked her these questions about the job, she told me it would be very engaging and challenging, despite its lower level. I heard in both her words and tone that she was excited about the growth and challenge ahead. She could do this job with her skills, knowledge and ability to adapt and learn. She was ready to go for it. Was this a good organization and boss fit? This was a premier company with an excellent reputation for work environment and corporate culture. It was fast paced and challenging, but did not seem to be a “burnout”environment. The boss was known to her, and she anticipated an excellent working relationship. Was this a good fit personally (salary, location, hours)? While the salary was lower than her last job, it was fair and logical for its level and the industry. She could make this salary work for her family. The location was a major city in California, and having close relatives nearby was a big plus for her. The cost of living was higher, but she and her family could make this work. The hours and demands would be draining at times, but no more so than she was used to. If you answered yes to all three questions, why not call them now? I was concerned that waiting until Friday could send the message that she too was hesitant about the job, had her own concerns about being overqualified, and might be wavering on the decision. Why not call the hiring manager today and preempt their “overqualified” concerns? She made the call that same day, emphasizing her fit in each of the areas described above, and received a job offer the next day. Could this be a strategy and script for you? “I gave evidence of my adaptability through an example of a time in my career where I needed to get up to speed quickly in a new role and demonstrate significant leadership due to lack of credibility in the former leader. I recall that the discussion on starting salary was tricky. I told them that, to me, rewards had always followed my performance and that while I expected to be paid fairly and competitively, initially replacing my salary was less important to me than meaningful work, great colleagues and an opportunity to develop new skills. That seemed to resonate. It also happened to be true! https://georgedow.com/wp-content/uploads/2018/12/masthead-2.png 0 0 George Dow https://georgedow.com/wp-content/uploads/2018/12/masthead-2.png George Dow2018-07-25 10:26:372018-07-25 10:26:37Career Crossroads after 50... From "Overqualified" to "When can you start?"